Sheogorath is the Daedric Prince of Madness. During the quest The Mind of Madness, a mad beggar asks you to find him in Pelagius Wing, located in the Blue Palace. As it turns out, he is "on vacation" in the mind of the insane Emperor Pelagius the Third, whom Sheogorath considers an "old friend". You must then escape the mind of Pelagius using Sheogorath's signature artifact, the Wabbajack, before he will agree to return to his realm. 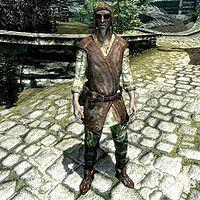 Sheogorath wears a unique outfit and boots, and carries an iron dagger which he never uses. For historical information, see the lore article. "You'll help me! You help people, right? That's what you do?" In Solitude, you may hear a rumor from innkeepers that a mad beggar is wandering around the streets of the city, distressed over the absence of his master, saying things like: "Please, take pity on an old madman!" and "You! You'll help me! You help people, right? That's what you do?" The beggar, named Dervenin, will plead you to find his master: "My master has abandoned me! Abandoned his people. And nothing I say can change his mind. Now he refuses to even see me. He says I interrupt his vacation! It's been so many years... Won't you please help?" He will tell you that his master was "visiting a friend in the Blue Palace" and further detail that his master "went into the forbidden wing of the palace, to speak with an old friend". He will give you Pelagius' Hip Bone, required to enter the forbidden wing. You also need to retrieve the key to the wing, either from one of the cleaning staff or from Falk Firebeard, the steward. "More tea, Pelly my dear?" 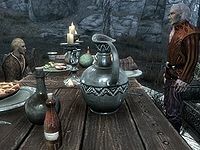 Sheogorath: "More tea, Pelly my dear?" Pelagius: "Oh, I couldn't. Goes right through me. Besides, I have so many things to do... So many undesirables to contend with. Naysayers. Buffoons. Detractors. Why, my headsman hasn't slept in three days!" Sheogorath: "You are far too hard on yourself, my dear, sweet, homicidally insane Pelagius. What would the people do without you? Dance? Sing? Smile? Grow old? You are the best Septim that's ever ruled. Well, except for that Martin fellow, but he turned into a dragon god, and that's hardly sporting... You know, I was there for that whole sordid affair. Marvelous time! Butterflies, blood, a Fox, a severed head... Oh, and the cheese! To die for." Pelagius: "Yes, yes, as you've said, countless times before..."
Sheogorath: "Hafrumph [sic]! Well then, if you're going to be like that... Perhaps it's best I take my leave. A good day to you sir. I said good day!" Pelagius: "Yes, yes, go. Leave me to my ceaseless responsibilities and burdens..."
After Pelagius disappears, you may greet Sheogorath, who will comment, "How rude! Can't be bothered to host an old friend for a decade or two." You can ask him who he was talking to, and he will tell you, "Emperor Pelagius III. Now surely even you know about Pelagius' decree? On his deathbed - oh, and this was inspired - he forbade... death! That's right! Death! Outlawed!" Should you ask, he will also remind you where you are: "Inside the mind of Pelagius, silly. Oh. Is it your... first time?" Upon telling him you're here to deliver a message, he will show excitement, saying, "Reeaaaallllyyyy?" and guess, "Ooh, ooh, what kind of message? A song? A summons? Wait, I know! A death threat written on the back of an Argonian concubine! Those are my favorites." before urging you, "Well? Spit it out, mortal. I haven't got an eternity! Actually... I do. Little joke. But seriously. What's the message?" If you choose the option to tell him that you were asked to retrieve him from his vacation, he will ask, "Were you now? By whom?" before saying, "Wait! Don't tell me! I want to guess! Was it Molag? No, no... Little Tim, the toymaker's son? The ghost of King Lysandus? Or was it... Yes! Stanley, that talking grapefruit from Passwall. Wrong on all accounts, aren't I?" and digress, "Ha! No matter! Honestly, I don't want to know. Why ruin the surprise? But more to the point. Do you - tiny, puny, expendable little mortal - actually think you can convince me to leave? Because that's... crazy. You do realize who you're dealing with here?" Your other option is to comment that you think you made a mistake coming here, and Sheogorath will reassure you, "Oh, no no no! No mistake at all. What you made was a choice. Granted, not a very wise choice, but these things happen. Ah, the folly of youth..." and elaborate on his past: "You know, you remind me of myself at a young age. All I cared about was riding narwhales and sleeping in honeycombs and drinking babies' tears... Word of advice if you ride a Narwhale. Mind the pointy end." He will then remember why you're here: "Ah, but there I go, waxing poetic about my misspent youth. Now where were we? Ah yes. You're the mortal messenger. An [sic] I am...? Honestly. Have you any idea?" "You do realize who you're dealing with here?" "I'm afraid I don't know, sir." "Wrong! Actually, you do. Sort of. I am a part of you, little mortal. I am a shadow in your subconscious, a blemish on your fragile little psyche. You know me. You just don't know it. Sheogorath, Daedric Prince of Madness. At your service." "Jolly good guess! But only half right. I'm a mad god. The Mad God, actually. It's a family title. Gets passed down from me to myself every few thousand years. Now you. You can call me Ann Marie. But only if you're partial to being flayed alive and having an angry immortal skip rope with your entrails. If not... Then call me Sheogorath, Daedric Prince of Madness. Charmed." "All I know is that your people need you to return." "Yaaawwwwnn.... Oh, pardon me. Were you saying something? I do apologize, it's just that I find myself suddenly and irrevocably... Bored! I mean, really. 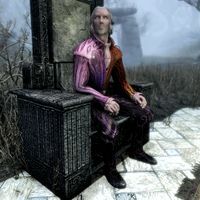 Here you stand, before Sheogorath himself, Daedric Prince of Madness, and all you deem fit to do is... deliver a message? How sad." You can now ask if what he said means he'll leave or not, to which he will reply, "Now that's the real question, isn't it? Because honestly, how much time off could a demented Daedra really need? So here's what I'm going to do. I'm going to leave. That's right. I'm done. Holiday... complete. Time to return to the hum drum day-to-day. On one condition. You have to find the way out first. Good luck with that." Either way, Sheogorath will remind you of your location: "Care to take a look around? This is not, I dare say, the Solitude botanical gardens. Have you any idea where you are? Where you truly are? Welcome to the deceptively verdant mind of the Emperor Pelagius III. That's right! You're in the head of a dead, homicidally insane monarch." He will offer you help, however: "Now, I know what you're thinking. Can I still rely on my swords and spells and sneaking and all that nonsense? Sure, sure. Or... you could use... The Wabbajack! Huh? Huh? Didn't see that coming, did you?" and end by giving you his artifact, the Wabbajack, and taking a seat. As you set out to fix the mind of the mad Emperor, Sheogorath (or rather, his voice) will try to help you by explaining what you have to do in each part. If you go to your left, the Arch of Paranoia, he will say, "Oh, good choice. Well, good for me. I find everyone being out to get you so terribly entertaining. You might find it... less so. You see, Pelagius' mother was... well... let us say 'unique.' Although, I suppose in the grand scheme of things, she was fairly average for a Septim. That woman wielded fear like a cleaver. Or did she wield a cleaver and make people afraid? I never get that part right... Oh, but she taught her son well. Pelagius learned at a very early age that danger could come from anywhere. At any time. Delivered... by anyone." You will reach a small arena, where you will see a version of Pelagius with two other men sitting behind him, watching two storm atronachs fighting. Sheogorath will instruct you, "The objective here is simple, you simpleton! Use your Wabbajack to defeat the enemy, while they do the same!" If you zap one of the storm atronachs, the fight will go on as both atronachs undergo the same changes, and Sheogorath will comment on it: "Hmm... Your creature doesn't appear to be fairing [sic] any better than before. Methinks your aim is off." If you instead shoot one of the men behind Pelagius, the two men will turn into wolves and attack the Emperor, while Sheogorath will cheer, "Oho! I thought you'd never figure it out." As Pelagius and the wolves disappear, Sheogorath will announce, "With the threat gone Pelagius is under the delusion that he is safe, which means you've helped him out... sort of. And we're that much closer to home." Another option is to go to your right, the Arch of Confidence. Sheogorath will remark on Pelagius' self-loathing: "Ah, now this is a sad path. Pelagius hated and feared many things. Assassins, wild dogs, the undead, pumpernickel... But the deepest, keenest hatred was for himself. The attacks he makes on himself can be seen here fully. They are always carried out on the weakest part of his fragile self." You will see Pelagius' huge Anger beating up his tiny Confidence. He will explain the situation and how you come into play: "The self-loathing enhances Pelagius' anger! Ah, but his confidence will shrink with every hit. You must bring the two into balance." If you find it difficult to tip the scales, he will help you: "You seem to be having a small problem... or perhaps it's a big problem? Maybe if you shrunk the whole thing down a little first?" When you balance things out, Sheogorath will respond with, "Wonderfully done. Pelagius is finally ready to love himself... and continue hating everyone else." Alternatively, you can go to the Arch of Night Terrors just behind Sheogorath, who will say, "You've headed down the path of dreams. Unfortunately for you, Pelagius suffered night terrors from a young age." You will find a tormented Pelagius sleeping, and Sheogorath will tell you that, "All you need to do is find something to wake our poor Pelagius up. You'll find his terrors easy to repel... but persistent." 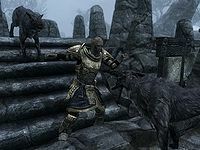 When you've used the Wabbajack to eliminate Pelagius' night terrors, the Daedric Prince will congratulate you, "Well now, that's something to crow about. With Pelagius up and about you're moving right along. We'll both be home in no time." "His paranoia is gone." "Oh... lovely. Now all my dear Pelagius has to worry about are the several hundred legitimate threats... But you're not out of the woods yet! Get it? Out of the woods?" "No more self loathing for Pelagius." "Ah, wonderful, wonderful! Why waste all that hatred on yourself when it can so easily be directed at others! But someone still has quite a bit to do. Hmmm?" "He'll sleep peacefully now." "Ah! Good, good! No more barking at all hours, and chewing up my slippers. You used the hemlock, then? Damned good idea! I... Um... We're not talking about Barbas, are we? Clavicus Vile's... dog? Oohh... awkward. Oh! That's right! Pelagius! Yes, yes, now I recall. Well done, well done. Now keep going." "Self loathing? Conquered. Paranoia? Abolished." "Mortal? Insufferable. Yes, yes, you're entirely brilliant. Conquering madness and all that. Blah blah blah. But you're not done yet. And you could still die..."
"No more night terrors, no more paranoia." "Ah, so now my dear Pelagius can hate himself for being legitimately afraid of things that actually threaten his existence... ...but only during... the day? Honestly, I can't keep up. But by all means, don't stop now." "The night terrors and self loathing are gone." "Oh, I am so happy for you! My, what a burden to have carried. But you've done it! You've conquered your own inner demons! Bravo! Um... You... didn't mean... yourself. You meant... Pelagius... Well! Same congratulations apply! Just, you know, for what you did for the insane emperor. Conquering paranoia should be a snap after that ordeal, hmm?" If you have finished everything, you can now announce that you've done it and fixed Pelagius' mind, which Sheogorath will ponder, "Hmmmm... 'Fixed' is such a subjective term. I think 'treated' is far more appropriate, don't you? Like one does to a rash, or an arrow in the face." before complimenting you for not dying during the quest: "Ah, but no matter. Heartless mortal that you are, you've actually succeeded and survived. I am forced to honor my end of the bargain. So congratulations! You're free to go!" He will then give you a friendly reminder of his domain: "I... have been known to change my mind. So... go. Really." and end the conversation. Note that if you have done all parts of Pelagius' mind without reporting to Sheogorath, this will be the only dialogue option you have. Sheogorath will then go on to say, disappointed, "Pelagius Septim the Third, once the Mad Emperor of Tamriel, now so boringly sane. I always knew he had it in him!" as he prepares for the trip: "Well, I suppose it's back to the Shivering Isles. The trouble Haskill can get into while I'm gone simply boggles the mind... Let's make sure I'm not forgetting anything. Clothes? Check. Beard? Check! Luggage? Luggage! Now where did I leave my luggage?" Dervenin will be summoned opposite him, overjoyed that his master will return to the Shivering Isles. Sheogorath, however, won't be as happy. The two will have a brief conversation before Sheogorath sends Dervenin back to the Isles. Dervenin: "Master! You've taken me back! Does this mean we're going home? Oh, happy times! I can't wait to..."
Sheogorath: "Yes, yes, that's quite enough celebration. Let's send you ahead, shall we?" 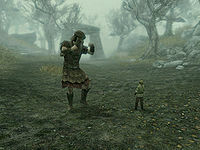 After Dervenin disappears, Sheogorath will address you, "And as for you, my little mortal minion... Feel free to keep the Wabbajack. As a symbol of my... Oh, just take the damn thing." and bid you farewell: "You take care of yourself, now. And if you ever find yourself up in New Sheoth, do look me up. We can share a strawberry torte. Ta ta!" You will be teleported out of Pelagius' mind, completing the quest. This is the first appearance of Sheogorath without his cane. Sheogorath is invincible and cannot be pickpocketed or harmed in any way. Even using the kill console command will have no effect. However, when you use the killall console command, Sheogorath will bend on his knees like a wounded essential character. 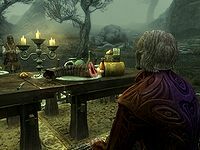 In his conversation with Pelagius, Sheogorath recounts some of the events in Oblivion, rattling off a list of seemingly unrelated objects: butterflies, blood, a Fox, a severed head, and cheese. These likely reference the beginning of Shivering Isles, the Blood of the Daedra/Divines main quest, the Gray Fox of the Cyrodiil Thieves Guild and the severed head of Mathieu Bellamont's mother. The cheese may be in reference to Sheogorath's Daedric Shrine quest in Border Watch, or to Sheogorath's infamous line "Cheese! For everyone!" in celebration of the reactivation of Xedilian. 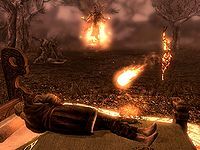 These comments, coupled with his remark that the Mad God is a title that is "passed down from me to myself every few thousand years", suggests that he may be the Champion of Cyrodiil who replaced the previous Madgod. "Oh, this is going to be fun. You've got to use your Wabbajack to defeat the enemy while - get this - they use their Wabbajack to defeat you!" This page was last modified on 23 October 2018, at 10:29.